Adding coriander to meatballs will give them a delicious North African kind of taste...so says Martha Stewart. But that's if you're into that sort of thing. She also says guest rooms should be decorated with fresh, neutral colors. But again, advice you can take or leave. However, it is Martha Stewart's advice. Not just anyone's. She knows her way around a lemon zester and how to get your sheets smelling like lavender. 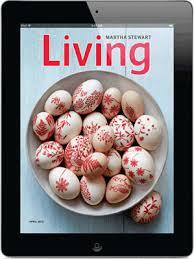 Just look at Martha Stewart Living magazine's cover this month. So very Molly-ish. If I were an Easter egg, pretty sure I'd look like one of those. The big wide world of decor, food, gardens, and crafts - Martha's specialty. But what about funny things? Not her specialty. The perfect smoky eye? * No bueno. Maximizing your calorie burn on that power walk? Not even close. But what about choosing the perfect table centerpiece for your Easter celebration? Well by all means, let Martha Stewart take the reigns. It is her specialty. Besides, he made me. Who else is better qualified? Same with dishwashers. A random thought, but I would never read my dishwasher's instructions to figure out why my alarm clock goes off at odd times. Actually, I would never read those instructions to begin with - just keep pushing buttons. But if I had to read something, I'd keep it matchy-matchy to the appliance. -Yet so authoritative that fierce storms would be quieted by His word (Mark 4:39). -Yet so commanding that a single look from him parted an angry crowd intent on doing him in (Luke 4:29-30). -Yet so righteous was he that his blood could wash away the sin of the entire world (1 John 2:2). So not only is Jesus the answer to "What happens if I die today?" but also the answer to "What happens if I live today?" Now I don't know about Martha Stewart, but that's what I call real LIVING - making this Easter eggstra-special. *Get your smoky eye here: Michelle Fallman Makeup. She's amazing.